Please be sure to directly contact properties to confirm deal availability before traveling, as many deals can change or expire. Tuckerman B&B Deal: Ski the headwall, hike the White Mountains, or enjoy Mount Washington Valley’s quiet season. Now through April 30, make Joe Dodge Lodge in Pinkham Notch your base camp – includes lodging and all-you-can-eat breakfast – at just $49 per night member/$59 non-member. Call 603-466-2727 for reservations. Must mention package specifically when booking. Extended Stay Savings: Save 10% on a 3-night stay, or 20% on a 5-night stay, at New Hampshire Lodges & Huts. This offer is available during the full-service season, Sunday-Friday, at any combination of AMC Huts, the Highland Center in Bretton Woods and Joe Dodge Lodge in Pinkham Notch. Bunk Deals at Highland Center Lodge: You couldn’t pick a better spot to explore the White Mountains of NH. Based in the heart of Crawford Notch – you’re steps away from endless adventures. Set up basecamp here by booking a bunk room with dinner and breakfast included, starting at $75. New Members Stay & Save: Book your first getaway at an AMC Lodge or Hut in New Hampshire and save $25 on your stay (2-night minimum). Offer valid during the full-service season and must be made within 90 days of your member sign-up date. Log in to My Outdoors, select “Exclusive Member Deals” and “First Time Stay Coupon,” and you will receive your promo code. Special Savings at Carter Notch: Enjoy awesome views, cool lakes and and extra 20% off when you stay at Carter Notch. Open year-round. Canopy Tour Flash Sale: Named one of Yankee Magazine’s “Unforgettable Guided Adventures,” it’s time to check this one off your bucket list. Regularly up to $110 per person, buy now and get: • 2 Tours for $139 – Just $69.50 per person; total value up to $220! • 4 Tours for $249 – Just $62.25 per person; total value up to $440! Tours valid Monday-Friday, May 1-October 31, 2019, black-out dates apply. OR upgrade to ANY DAY tours including weekends with NO black-out dates during the same period and get: • 2 Tours for $169 – Just $84.50 per person; total value up to $220! • 4 Tours for $299 – Just $74.75 per person; total value up to $440! Must be purchased online. Patriot’s Day – April 15th: Join us for the final day of the 18-19 season with $17.76 tickets AND receive a return voucher to kick off the next season, valid opening day through December 13, 2019. • Escape & Save: Get away for a little while at Omni Mount Washington Resort and receive 10% off our flexible rate when you stay two or more nights. Go ahead and take a break—you’ve earned it. Two Nights for the Price of One: For a limited time, reserve any room on our Best Available Rate at the legendary Omni Mount Washington Hotel and receive your second consecutive night for FREE! Available through May 31, 2019. Valid Sunday-Thursday, plus select weekends. Book direct here. • Simply Spa-tacular Package: Enjoy a $100 daily spa credit, a glass of wine or champagne each night following your spa treatment, nightly turn down service, a special welcome gift and daily breakfast. Spring Into Savings: There may still be snow in the forecast, but spring is almost here! For a limited time, we are offering 30% off accommodation with dates through June 13, 2019. This package also includes a $30 resort credit that can be applied towards a variety of resort amenities. To book your stay, please contact our Reservations Team at 833.956.8541. Tower Spa Experience Package – Wonderful for couples and groups alike, the Tower Spa Experience Package offers guests a chance to relax and rejuvenate during their White Mountain escape. This package is only bookable over the phone. To book this package, please call 855.837.2100. Bed & Breakfast Package: Enjoy a hearty White Mountains breakfast while sipping coffee and taking in the mountain views. To book this package, please call (855) 837-2100. Rest & Relaxation Package: Lay back and rejuvenate in the beautiful White Mountains. Our Rest & Relaxation Package offers breakfast each morning along with a bottle of wine upon your arrival, and a $200 spa services credit per stay. To book this package, please call 855.837.2100. 3 for 2 Promotion: Arrive on Sunday, Monday, or Tuesday, stay for two nights at our Best Available Rate, and your third night is free! Restrictions apply. To book this package, please call (855) 837-2100. 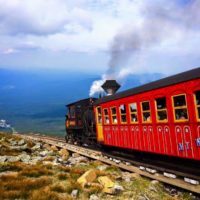 The Cog Railway Reopens for the 2019 Season: The Cog is open weekends beginning Saturday, April 6, for 1-hour rides to Waumbek Station. Full service, round trips to the top of Mt. Washington begin on Saturday, May 11, 7 days a week. Opening May 25: Our 2019 season will begin on Saturday, May 25. We look forward to seeing you all then! Snowmobile Rentals Through April 15: We have added Polaris snowmobiles to our fleet and are now a year-round, on-road and off-road operation with winter adventures starting in mid-December! Say goodbye to cabin fever and hello to endless winter outdoor activities in Pittsburg, NH. Call to reserve: 1-866-663-9777. Lopstick Fly Fishing Experience: Spend a day on the Upper Connecticut River with our Orvis Endorsed fly fishing guides and learn the how to catch landlocked salmon and trout in New England’s premier fishery! The Fly Fishing Vacation Package includes 2 or 3 nights lodging for two, one or two full day of wade-fishing, stream side lunches, and use of Orvis fly fishing gear. Call (800) 538-6659 for more info & to book your stay. Adventure Weekend & Midweek Dining: Our Weekend Adventure Package and Midweek Dining Plan offers the perfect combination of activity and relaxation. Hike, canoe, or kayak and enjoy meals from our Rainbow Grille. Available May 10-October 15, 2019. Rainbow Grille Escape & Midweek Dining Plan: Our Rainbow Grille Escape Package and Midweek Dining Plan is the ultimate in relaxation. Lots of great food, plenty of outdoor activities … and fun. Available May 10-October 15, 2019. Senior Midweek Dining Plan: Sixty’s young … why not be rewarded for it? Relax and reconnect with someone special at discounted rates! Available May 15-June 13, 2019 & September 2-October 15, 2019. Fly Fishing School Weekend Package: Take your first step to learn the art of fly fishing. Our instructors have three decades of experience and are excited to get you started! Available May 31-June 2, 2019 & July 12-July 14, 2019. Spa Treatment Midweek Dining Plan: Experience the beauty of NH’s north country and come back to the lodge for relaxing spa treatments from our professionals. Relax … Available May 15-October 15, 2019. Winter Packages: Choose from Midweek, Weekend & Vacation Week Getaways. Stay & Eat Packages include overnight lodging, full course dinner, complete breakfast, full use of recreational facilities & all taxes and gratuities. Offer good through May 1, 2019. Ski & Stay Super Savers: The Ski Wildcat/Attitash Super Saver Packages for midweek or weekend stays include overnight lodging, complete breakfast, lift ticket, full use of recreational facilities & all taxes and gratuities. Weekend rates apply to holidays and school vacation weeks. Every Friday is TGIF: Join us every Friday starting at 4 p.m. for our TGIF Party (Thank Goodness It’s Food!) Free hors d’oeuvres 4-6 p.m., drink specials, and the company of good friends. Customized Experiential Tour: Whether you’re interested in learning about wildflowers or maple syrup, wildlife habitat or local history, there’s a world of discovery to be had at The Rocks. Our guides offer personalized tours of the 1,400-acre property; available year-round, by appointment, for individuals or small groups. Our guides customize each tour based on participants’ interests. Closed for the Season: Mohawk Falls is closed for the season and will re-open on May 12, 2019. Inquire about booking your wedding or special event. Mini Mush: Join us for a modified version of our 1.5-hour tour and save! Book your adventure today! Sunday Special – Fried Chicken Special: Join us at The Beal House on Sunday evenings, 5-9 p.m., for our Sunday Special – Fried Chicken ($12), and Draft Beers ($3). Modelo Mondays: Start the week off right with our yummy Tacos ($3), and a Modelo Can ($3). Thursday is Burger Night! Your choice — a juicy burger and a craft draft beer ($11), or pair that burger with a glass of wine ($15). Friday Night Date Night: On BOGO Fridays, Buy One Get One Free on all day passes, open climb passes and learn to climb lessons. Must print out or mention this ad.